WhirlyBall combines basketball, floor hockey, lacrosse, and bumper cars all rolled into one! 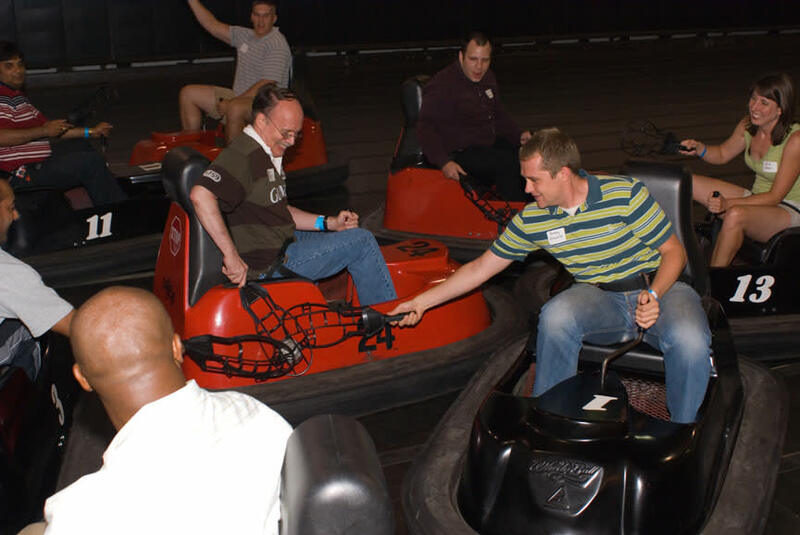 Whether you're planning an Off-Site Meeting or Corporate Outing, Team Building Session, Bar/Bat Mitzvah, Birthday, Bachelor or Holiday Party, WhirlyBall is the most complete venue in Chicagoland offering a variety of entertainment options, a complete F&B menu, and flexible event facilities that can comfortably accommodate 10-500 attendees. Three convenient locations: Chicago, Lombard and Vernon Hills. Stop in anytime and enjoy our full-service sports bar featuring giant HD screens and incredible sound, a mouthwatering food menu, three WhirlyBall courts, 12 bowling lanes, a multi-level laser tag arena (Chicago & Vernon Hills), air hockey, foosball, video games and pool tables galore (Lombard & Vernon Hills)! Reservation Cancellation Policy: http://www.whirlyball.com/planning/policies.php Event and Package Confirmation and Cancellation Policies Event Confirmation In order to confirm your reservation a 50% deposit is required. This deposit will be applied to the cost of your event and the balance will be due immediately prior to the start time of your reserved time. If the deposit is not received within 7 days from your Booking Date, then the reserved time is subject to cancellation at WhirlyBall’s sole discretion and without notice. If another group requests your tentatively reserved time within those 7 days, then you will be given the opportunity to guarantee your reservation prior to its release to another party. Package Confirmation: Party Packages (Events which include food and/or beverages) must be confirmed with a 50% deposit, otherwise space will be released. This deposit will be applied to the cost of your event and the balance will be due immediately prior to the start of your event. If the deposit is not received within 7 days, then the space is subject to cancellation at WhirlyBall’s sole discretion. If another group requests your tentatively reserved time within those 7 days, then you will be given the opportunity to guarantee your reservation prior to its release to another party. Party Packages contracted within fourteen days of the scheduled event must be paid in full upon execution of the party package contract and are non-refundable. No outside food or beverages are allowed. Cancellations Event Cancellations: If you must cancel for any reason more than 7 days in advance of your event, then your 50% deposit is forfeited unless we are able to re-sell your reserved time. If cancellation occurs within seven (7) days of your event, then 100% of the event cost shall become immediately due, your deposit will be applied to the amount due and you hereby authorize WhirlyBall to charge any remaining balance to the credit card initially used when confirming the event with an online payment. Party Package Cancellations: Once a Party Package has been confirmed, cancellations for ANY reason more than fourteen (14) days in advance of your event will forfeit the deposit and the reservation shall be released. Deposits are non-transferable unless WhirlyBall is able to book the reserved date and time with the same minimum guarantee. If Party Package cancellation occurs within fourteen (14) days of your event, then 100% of the Party Package cost shall become immediately due, your deposit will be applied to the amount due and you hereby authorize WhirlyBall to charge any remaining balance to the credit card initially used when confirming the event with an online payment.